Alexis Santos-Lozada is an assistant professor of human development and family studies at Pennsylvania State University. Prior to his teaching position at Penn State, he was a post-doctoral fellow for the U.S. Department of Energy at Brooke Army Medical Center in Fort Sam Houston in San Antonio, Texas. As a postdoc, he provided analytical expertise to projects in the areas of Military Health and Burn Rehabilitation. Santos-Lozada was born to Puerto Rican parents. He is a population health scientist whose research examines policy implications of demographic trends in the United States and around the globe. Santos-Lozada’s current work focuses on the mortality estimates in Puerto Rico following Hurricane Maria. 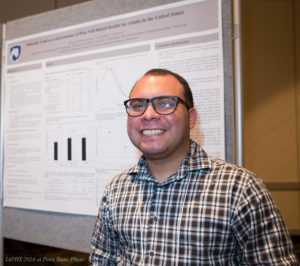 He co-authored a study with fellow alumnus and Assistant Professor Jeffrey Howard.’14 on the death toll in Puerto Rico after the storm made landfall in September of 2017. Santos-Lozada and Howard took into account deaths directly tied to the hurricane following months from infectious disease outbreaks or lack of services like electricity, water and medical care. Their study, published in the Journal of the American Medical Association explains that the death toll is likely ten times higher than what the government reported. Their study received extensive coverage in multiple media outlets across the world.